Around this time every year, I require my 4th grade students to memorize the helping verbs. I have a specific order for the 23 verbs that fits perfectly to the tune of “Mary Had a Little Lamb”. I usually call some of my former students from across the hall to demonstrate The Helping Verb Song. My former students never fail to provide an excellent demonstration. Once the song is committed to memory, it will be burned into your brain for the rest of your life. Memorizing helping verbs aids students with a variety of language arts tasks. Many of the verbs on the helping verb list are difficult. They are the verbs that don’t sound like verbs– the being verbs are the main culprit. Often, words from the helping verb list appear alone in a sentence. In that situation, the helping verb IS the verb. It is easy to identify because of the memorized list of verbs. I can’t visualize a person “is-ing”, but I will mark it because it is from the helping verb list. Just say the list in your head every time you look at a sentence to check for the tricky verbs. Locating these tricky verbs will be useful when students are working with linking verbs. Helping verbs create past, present, and future. 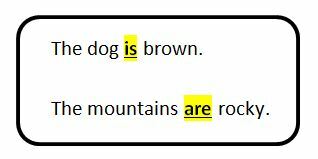 In order to identify verbs in sentences, students will need to find the main verb and any helping verbs that go with the main verb. This will be called the complete verb or verb phrase; it’s part of the predicate (fancy word for action part of the sentence). Teachers love to ask students to find the complete verb in sentences. Students should find the main verb in a sentence. Students should then recite the helping verb list in their head and look for any helping verbs in the sentence. If they see one (or two), group it with the main verb and label the complete verb. WARNING: Not is NOT a verb, but it lurks about in the middle of helping verbs and their main verb partner. In the sentence, “I do not enjoy grammar,” do enjoy is the complete verb. Not is an adverb. Teachers want students to eliminate passive voice in papers, yet students rarely know how to do it. Have a student circle all verbs from the helping verb list that appear in an essay. Then, revise the paper taking out half of the circled verbs. This tip fixes passive voice in many cases without really knowing it. Ultimately, we want students to avoid passive voice on purpose, but this is a great work around until a student has more experience avoiding passive voice. Grammar is a frustrating subject for students. There are exceptions to every rule. Students who have some reliable tools to help during confusing grammar situations do better. For some other grammar tips for students, visit my previous grammar post. Click this helping verb list or The Helping Verb Song to grab a printable list of helping verbs. Click HERE to view and purchase grammar materials I have available in my teacher store.